In 2005, First Sergeant Charles Monroe King began to write what would become a two-hundred-page journal for his son in case he did not make it home from the war in Iraq. He was killed by a roadside bomb on October 14, 2006. His son, Jordan, was seven months old. A Journal for Jordan is a mother’s letter to her son about the father he lost before he could even speak–including a fiercely honest account of her search for answers about Charles’s death. It is also a father’s advice and prayers for the son he will never know. Finally, this is the story of Dana and Charles together–two seemingly mismatched souls who loved each other deeply and lost each other too soon. DANA CANEDY is a senior editor at the New York Times, where she has been a journalist for twelve years. In 2001, she was part of a team that won a Pulitzer Prize for national reporting for "How Race Is Lived in America," a series on race relations in the United States. Raised near Fort Knox, she lives in New York City with her son, Jordan. "This book is a gift, and not only to Jordan." "At once inspiring and ineffably sad . . . Canedy captures the unique magnificence of the man she loved in a way that brings the beginnings of an understanding to the losses that other families bear." "This tragic story of love and war reminds all Americans that we are fortunate to have people like Sgt. Charles King, willing to die for our country. Dana Canedy bears witness to the enduring power of love, to Sgt. King's heroism and his unfailing devotion to his family and his men." "This book is a living, breathing legacy. It's full of wonderful treasures offered by a unique and spirited father, whose loving words of wisdom to his infant son are a rite of passage that will transform us all. It is written with serene grace: part memoir, part love story, all heart." When Dana describes her ideal man, she envisions someone like her New York self. Should an ideal mate be like you or unlike you? How does her ideal evolve? How are Dana and Charles different and how are they similar? Are they as different as Dana thinks? How does Dana’s ambivalence toward her father affect her relationship with men? How does her view of her father change after Jordan is born? If you have children, did parenthood make you more or less accepting of your parents? How do Charles’ and Dana’s experiences as African Americans shape their choices? Both Dana and Charles struggle to balance challenging careers and their personal lives. How have you dealt with those demands in your life? What factors led Dana to shift her priorities and decide to have a child just as Charles was about to be deployed to Iraq? The book captures both the fast-paced world of journalism and the rigors of military life. What did you find interesting or surprising about their vocations? How did the chapters on Iraq affect you? Did it deepen your understanding of what is asked of soldiers and the nature of this war? 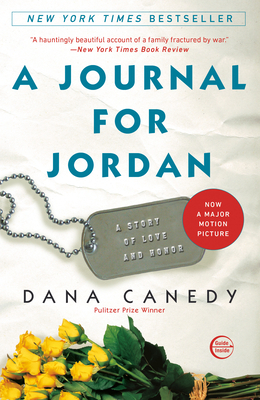 When Charles tells Dana that he will miss Jordan’s birth because his soldiers need him, do you understand his decision? Discuss the role of religious faith for Charles. How does Dana interpret his angel portrait? What does the drawing mean to Charles? When Dana investigates the fatal mission, she discovers that the military often sanitizes the circumstances of a soldier’s death. Should loved ones be protected from the truth in this way? Dana learns things she didn’t know about Charles from his journal. Do we ever fully know the ones we love? Does this book inspire you to learn more about your loved ones? Dana depicts a mature, romantic love. How do you feel about her decision to present their relationship, flaws and all, to their son? How is love defined? What does Dana mean when she says, “I realized that day our relationship would never be perfect. Only perfect for us”? Why does Dana make each chapter a letter? How does she use Charles’ journal and to what effect? What makes this book a compelling read that transcends one family’s grief? What is a father? Does anything in A Journal for Jordan lead you to rethink your definition?